I've shared you many SEO tips and tricks but this one is really important for you as this post will help you to understand the advantage of writing big posts rather than more posts which will ultimately help you to grab more organic traffic as well as subscribers too ! It's My Own Experience ! Really when i started this blog my full focus was to provide unique as well as quality content and that's why i wrote every post more than 500+ words which helped me get much more traffic than my old blog. The posts which were 1000+ words in this blog get too much success ! and get indexed in the search engines very easily ! READ- Why 3000+ Word Blog Posts Get More Traffic. There are many bloggers who spread myths involving their categories but some of them really don't even help you ! I'm taking about the daily content myth ! You must have heard it , Right ? According to some bloggers you should write posts daily no matter what you write , but wait ! Don't Ever Follow This Myth ! READ- Why You Don't Need To Post Daily Content On Your Blog ?. 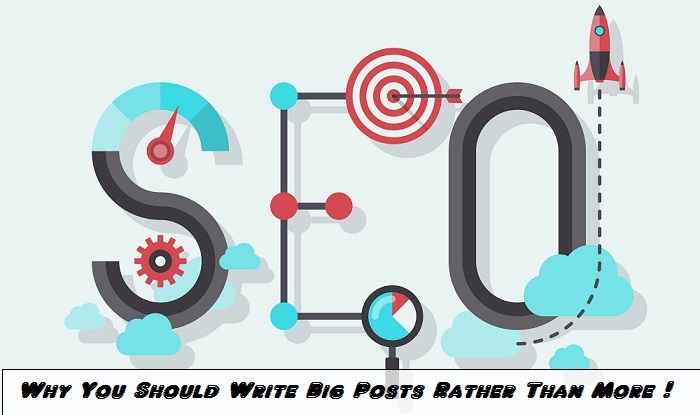 Really rather then focusing on writing content daily you should focus on writing big posts bigger than 1000 words which will really help you to get ranked in search engines easily. The More The Better ! This is the quote which almost every search engine has in its mind (Not Real One ! Haha..) . Rather than just writing big posts you should also write creative posts which will help you in indexing your blog faster. Meaning that if you're trying to paste crappy content in a post just to make it big than really the post will never rank ! I've been doing blogging since 1 year and till now I've learned that content is king for us as well for Search Engines. If you're a follower of Neil Patel then you must be knowing that his average posts size is around 2000 words ! And that's why his posts rank much more higher than the small ones. The main reason why big posts get more indexed is that big posts work like a complete guide which tells everything in a post or we can say it All In One Post . Which ultimately saves the visitors time as they don't need to search for other related topics again and again. A Big Post Can Do Work Of 10 Posts ! Really the line is quoted by me (any other also ?) but it really is true. The posts which I've written around 1300 words have derived me traffic of 4 posts ! (Not Gonna Mention Them !) And that's what i suggest you so that you may get the same. Pro Bloggers Always Focus On Writing Big Posts Around 1000 Words Or even more..
What If You've No Time ? Focus Only On One Post To Make It Best , Rather Than Thinking Of Writing More Posts . Take example of this post , it took me around 2-3 days to complete this post as i'm busy in my studies these days but what ? I've done the main thing which was of writing a quality post ! I didn't even thought of writing the post in a single day as i wanted to make this post as descriptive as i can. The myth that you should write post everyday has never worked for me or even not work for you too ! So if you're focusing on writing posts daily rather than focusing on its content than please change your way of blogging. I've been following many blogs and seeing the same from them as they just focus on the content they write not on the amount of posts they write. What If You Get Bored Writing Them ? So if you get bored writing big posts than internet is a big world , there are many things to enjoy through it. Use the Save To Draft Feature And Play games or listen to music to get your mind refreshed. Then What ? Come To Road Again ! And start writing again with your creative thoughts. That's what i do to get refreshed and start working back. Really If I would have more time then you may have seeing every post in this blog more than 2000 words ! as I've interest in my niche and that's what makes me to write big posts like this one. UPDATE- I've Told You May Times To Write More Than 500 Words But There Is An Update That You Should Write More Than 700 Words Due To Google Changes ! Nowadays there are may bloggers who are writing posts around 500 words which is making blogging difficult , therefore now you should write more than 700 words or even more so that you can defeat your opponents ! So this was the explanation that why you should write big posts rather than more posts , hope you liked this explanation and must have shared it also. Let me know your thoughts about the same through comments and do subscribe us ! Really, I appreciate your work on this blog. Keep working hard and I will keep wishing for your success. Thanks Abhishek For Your Kind Words :D Good Luck !